I have been sitting on these colors for a long time (Sept 9, 2011 - maybe?) and now I am finally getting down to getting them somewhere. 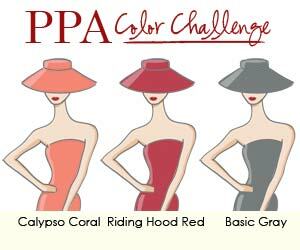 I love the Calypso Coral color! and with Grey! I would love an outfit in my closet made of it too! or even just a scarf...? I wanted some textures. I wanted to only have a little bit of Grey with my Calypso Coral and Red Riding Hood. It worked out well. Until I realized that my Red Riding Hood paper is just a tad different than my ribbon color, but guess what - open a new pack of paper and wa la it matches.. must have been a change in the color dye someplace down the line. I apologize for the lighting, but its not been very good to me! I used a Coral base, with layering the Grey under the DSP of Coral. Then I crimpled the grey and tucked it on a just the lower corner. 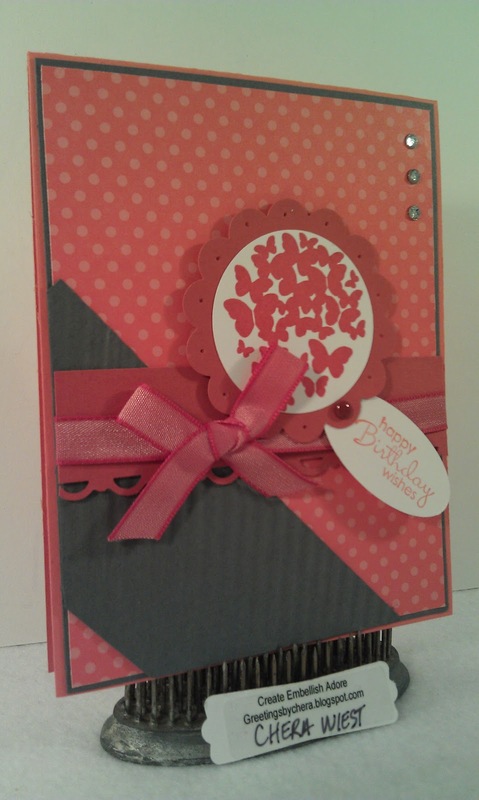 I used the scallop circle punch for the outside of the Precious Butterflies stamped in Red Riding Hood, I used the edge punch on the Red Riding Hood CS before attaching the ribbon. 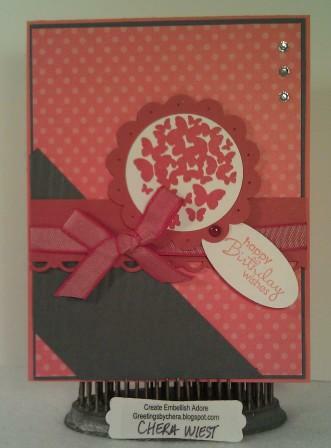 Finished off the card with adding the Petite Pairs, Happy Birthday. It looks better IRL. My apologizes! 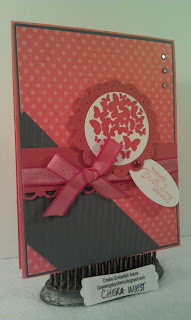 I like the design and the colors of this card, the coral and grey-I agree, great colors together!